NEWS REPORT: A brilliant finish to the Women’s EHF Champions League, and a stellar performance for Norway in the Men’s EHF EURO Qualifiers, respectively earned Anita Görbicz and Sander Sagosen the EHF Player of the Month award for May. For Anita Görbicz and Sander Sagosen, the season ended with plenty of success. Görbicz played a significant role in Györi Audi ETO KC winning the TIPPMIX EHF FINAL4, while Sagosen played a deciding role in Norway’s epic 35:30 win against France in the qualification tournament for the Men’s EHF EURO 2018. 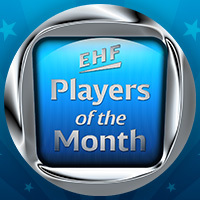 These performances are key to the fact that both players can now call themselves EHF Player of the Month. At the TIPPMIX EHF FINAL4 in Budapest in the first weekend of May, Anita Görbicz proved once again that she is back at full strength, after being hampered by injury for parts of last season. The 34-year-old-playmaker, now often seen in the left wing position, played a great part in Györi Audi ETO KC lifting the Champions League trophy, after they defeated HC Vardar 31:30 in extra time in the final. Her efforts that weekend in the Papp Laszlo Arena were a big part of the reason why she was awarded Player of the Month by the EHF panel of experts. “It is always nice to be acknowledged, and after all we do this for the fans, so it is very fulfilling to learn they appreciated my efforts,” claimed Anita Görbicz, who was the most prolific player of the title-winning Györi Audi ETO team. The world class playmaker, who has been used as a winger by Ambros Martín lately, feels May was an excellent month for her, and Györ, too. We caught Görbicz when she was with the Hungarian national team getting ready for the Women's IHF World Championship Qualifiers but she also gave her thoughts about the forthcoming VELUX EHF FINAL4. “I obviously root for Veszprém, and I believe they have a good chance to win it, albeit this is the strongest ever FINAL4. But I think the Hungarian team is very united whereas their opponents rely more on individual brilliance, which they surely possess. But I think a united team always beats a team of individuals, who play for themselves,” claimed Görbicz. Sander Sagosen has had plenty of reasons to celebrate lately. After scoring no less than 13 goals for Norway in their memorable 35:30 victory against France in the Men’s EHF EURO 2018 qualifiers on May 3, the 21-year-old back court player celebrated winning the Danish championship with Aalborg Handball on Sunday. With seven goals, and at least as many assists, Sagosen made a large contribution to Aalborg’s 32:25 away win against Skjern Handbold in the second leg of the Danish championship final. Only a few days after that triumph, Sagosen, who is leaving Aalborg for Paris Saint-Germain Handball after this season, was awarded EHF Player of the Month for the second time this season. “Wow, for the second time this season! That is just cool! That is the perfect crown to a perfect season for me and really a great honour,” exclaimed Sagosen. “My three years here in Aalborg have really been fantastic, and all I need now, to make the season absolutely perfect, is qualifying for the EHF EURO with Norway, but I am sure we will make it,” he said. When it comes to the VELUX EHF FINAL4 this coming weekend, it comes as no surprise that he is hoping for his future club, Paris Saint-Germain, to succeed. “I am not going to attend the event myself, as I will meet up with my teammates in the Norwegian national already Monday to prepare for our last EURO qualifiers against Belgium and Lithuania, but I certainly hope to be part of the action next year as a PSG player!” says Sander Sagosen.